Yvonne, a coral reef ecologist, is a postdoctoral researcher whose is using remote sensing to investigate coral reef community structure and community metabolism as part of the COral Reef Airborne Laboratory (CORAL) mission and runs flume experiments to validate remotely sensed coral reef metabolic rates. Currently, she also investigates what the driving factors of photosynthesis and calcification of reef organisms are on different spatial scales using microsensors, incubation chambers and in-situ gradient flux approach. 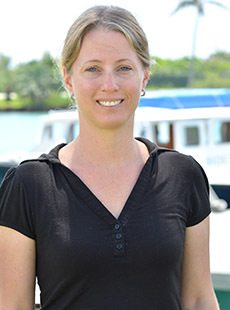 Yvonne received her PhD from the Leibniz Center for Tropical Marine Ecology/University of Bremen where she studied the resilience of coral communities to natural and anthropogenic disturbances. Following this, she joined GEOMAR, Helmholtz Center for Ocean Research (Kiel, Germany) where she accepted a postdoctoral researcher position, followed by a role as a research scientist. While at GEOMAR, Yvonne investigated coral adaptive mechanisms to strong latitudinal temperature and nutrient gradients in the Red Sea. Yvonne is currently accepting interns.